Since inception, the green roof research program at SIUE has been co-directed by Bill Retzlaff, PhD, and Susan Morgan, PhD. Along with Serdar Celik, PhD, they coordinate the efforts of other faculty, student researchers and collaborators as they evaluate green infrastructure performance. The team’s efforts have resulted in a significant body of work evaluating living architecture systems in areas such as volume and quality of stormwater runoff, plant performance, maintenance issues, biodiversity, thermal characteristics, weight loads, wind uplift, and new green roof technologies. Research continues in these areas as well as evaluating rooftop vegetable production and food access in urban deserts, native plant performance in green roof systems for stormwater runoff, thermal performance of green roof systems and the use of robotics for maintenance of living architecture systems. The following is a partial list of what GREEN. has accomplished. Many plant species and growth media have been evaluated and identified for green roof systems. We continue to expand on the list of possible plants and growth media blends, including recyclable materials. Quantity of storm water runoff from green roof systems planted with either sedums or native plants from our region have been evaluated over multiple seasons. Published data from our student’s research projects demonstrate that Sedum green roofs in the Midwest can retain up to 80 percent of the precipitation that falls during the growing season and on average retain 45-50 percent annually depending upon precipitation amount and green roof construct and design. 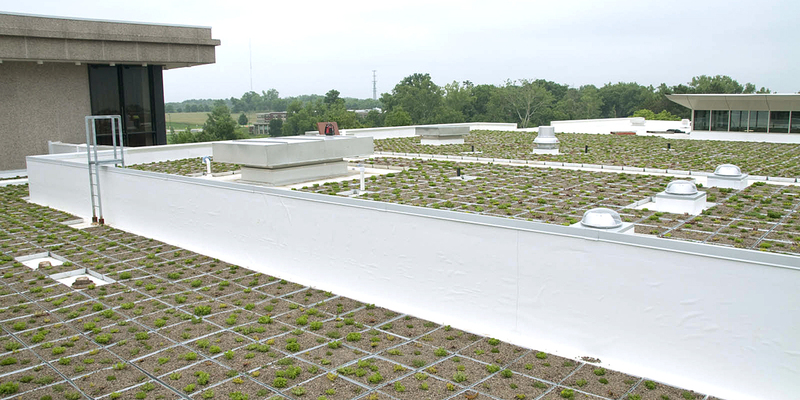 Stormwater runoff quality from green roof systems has been assessed. Published data from student research projects has demonstrated that green roof systems are not sources of nitrogen or heavy metals if designed properly. Traditional maintenance plans for green roof systems have been evaluated and published. In addition we are working on developing new maintenance practices using mechanical weeding and robotics. Thermal evaluations of green roof systems (whole on-roof systems, in the research lab with individual green roof components, as well as theoretical/empirical simulations) have demonstrated that green roofs can reduce the thermal load on the rooftop and, further, that plant species and growth media choices contribute to the thermal differences. We are currently examining whether green roof maintenance influences the thermal performance of green roof systems. Wind tunnel work funded by the National Roofing Contractors Association at SIUE that evaluated wind-uplift of green roof systems has been used with other research data to develop an ANSI standard (RP-14) for wind-uplift of green roof systems.